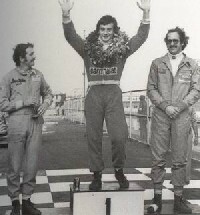 Riccardo Patrese made his first appearance in Macau having begun the year as reigning European F3 Champion, and he arrived not only having tasted his first F2 victory of the season at Fuji but also as a rising star in Grand Prix racing. In qualifying it was the Italian who took pole position with a time of 2m 21.32s. In doing so he not only beat his Australian rival into second place, but also pocketed $10,000 of Yip's money for beating Jones' lap record of the year before! Third on the grid was Vern Schuppan in John MacDonald's Ralt, followed by Steve Millen (Chevron B39), and Masahiro Hasemi (Chevron B40). Alan Jones took the lead at the start of the race but approaching Reservoir Bend for the first time the Ralt slowed and spun. Patrese had been following closely and was unable to avoid contact with Jones. "My engine cut out," said the disappointed Australian afterwards, "I turned on the fuel switch but, as it was about to fire, Patrese collided with me and I hit the wall. That was the end of it." Riccardo headed for the pits with damage to the rear of the car and lost 40secs waiting for repairs. He rejoined in 17th place, but was then faced with the black flag as officials were concerned about the damage. Reassured by the Harper pit crew the officials relented and Patrese began a remarkable fight back that saw him lap the entire field with three laps to go. Bob Harper was full of praise for the man who had given his team their first victory in Macau for seven years: "It was a sensational drive. This boy is going right to the top." Riccardo Patrese returned to Macau with Bob Harper's Marlboro-sponsored team in an effort to claim his second victory in a row. This time he would have both Derek Daly and Keke Rosberg (newcomers to F1 in 1978) as team-mates, while Alan Jones was once again representing Teddy Yip's Theodore team. Pole position was taken by Jones (March-Hart 782) in a time of 2m 21.19s, but Patrese was just 0.18s behind in second, ahead of Rosberg and Daly. Once again the Australian made the better start and headed Patrese and Daly away from the grid, but the Irishman soon found a way past and into the lead. Riccardo also dropped back behind Rosberg but their positions were reversed on lap six. Two laps earlier Jones had regained the lead but he was soon into the pits with a broken spark plug, leaving the Harper trio in a race of their own. The leading Chevron of Daly built up a gap of more than 10secs over his scrapping team-mates but on lap 13 he had to pit with worn tyres. At the same time Rosberg retired with a blown engine leaving Riccardo Patrese heading the field. Meanwhile, Alan Jones was beginning a fight back and was lapping three seconds a lap quicker than the leader but once again a broken spark plug halted his charge and ended his hopes of a win. Another to recover from an earlier setback was Derek Daly who overtook Hasemi and Cogan to take second position, but he was unable to make an impression on Patrese who won the race comfortably. The winner commented after the race: "We went very, very fast at the start and I had a lot of trouble with my gears. It was fortunate for me that Alan had to come into the pits. I know he was making a great effort to catch me when he came back onto the track, but the people in my pit were keeping me fully informed and I played with the time gap I had on him. There was no way he could have caught me in the 40-lap period, as I was judging my pace very carefully." Returning to the Guia circuit for a third time Riccardo Patrese once again teamed up with Derek Daly and Bob Harper's team. This time they would be racing March-Hart 792's. Teddy Yip had lined up established F1 'stars' Clay Regazzoni and Jochen Mass to challenge his Macau rival but both drivers were forced to pull out before the event. Illness sidelined Patrick Tambay, who had been called up as a replacement, and in the end Yip's Theodore team were represented by Geoff Lees, Rupert Keegan and Vern Schuppan. Other entrants included Kevin Cogan, Tom Gloy, Skeeter McKitterick and Bob Earl from Formula Atlantic in the USA, as well as the Malaysian Unipart-sponsored team represented by Sonny Rajah and Tiff Needell. For the second time in three years Riccardo Patrese secured pole position with a lap of 2m 21.17s which was 0.7s faster then 2nd placed man Cogan, and ahead of team-mate Daly with Needell 4th in the four-year-old March 76B. The pole man lead away from the start but was soon overtaken by Kevin Cogan and Bob Earl in the Flying Tigers Ralt RT1's. Needell had also found a way around the Italian. Cogan extended his lead while Patrese made his way into second place before Earl retired with engine problems. A damaged nose-cone slowed the leader slightly but he was able to hold onto first position until the damage forced him into the pits for a replacement, and eventual retirement. By now Patrese was leading, followed by Tom Gloy but the man on the move was Geoff Lees who had passed Tiff Needell for third. This was soon to become second as Patrese's March was beginning to sound quite sick. He lost the lead to Gloy and then, on lap 24, fell to third behind the charging Englishman. With less than 10 laps to go the suspension on Gloy's Ralt failed and a delighted Lees then held the lead to the chequered flag. The drama was not over, however. Bob Harper protested the winning car after speaking to his driver: "Riccardo told me that he was easily making up ground on Lees on the back, tight section of the course, but that Lees was pulling away from him on the straight. According to the design specifications, this should not have been possible. Riccardo was clearly very upset, and I had no alternative but to make a protest on his behalf." Several hours after the prize giving ceremony the officials confirmed that the result would stand, and that Geoff Lees was the winner.